If you’re in the market for a luxurious vehicle that has an aggressive stance, both the 2018 INFINITI Q60 and Q50 are sure to please. While the Q60 is a stylish coupe that’s ideal for adventurous drivers, the Q50 is a luxury sedan that also makes a great family vehicle. Both vehicles are equipped with the same standard turbocharged engine options and available Intelligent All-Wheel Drive system and both can be equipped with advanced technology such as Forward Emergency Braking and Backup Collision Intervention, giving both of these models the edge against competitors in the market. Both the 2018 INFINITI Q60 and Q50 are powered by a 2.0-liter turbocharged engine that delivers 208 horsepower. When operating at 1,500 RPM, this turbocharged engine boasts an impressive 258 lb-ft of torque. For even more power, both can be equipped with a 3.0-liter V6 engine that features dual turbochargers that yields a total of 300 horsepower and 295 lb-ft of torque. Step up and you will be treated to a modified version of this engine that can put out an incredible 400 horsepower and 350 lb-ft of torque. For greater fuel efficiency, drivers can choose the Q50 Hybrid which can produce a combined 360 horsepower. This powertrain option is paired with a 50-kW electric motor under the hood, making it a fuel-efficient luxury vehicle. Powertrain options are paired with a seven-speed automatic transmission with Adaptive Shift Control, which provides for effortless changing of gears. Both the 2018 INFINITI Q50 and Q60 can analyze the threat of a crash and utilize the Predictive Forward Collision Warning and Forward Emergency Braking System to mitigate and prevent a crash. The Blind Spot Warning System works with the Blind Spot Intervention system to help you stay in your lane, while Active Lane Control helps compensate for strong winds on the road. Both vehicles feature two separate LCD displays. GPS navigation and 3D maps with voice recognition are available on both vehicles. With the 16-speaker audio system in the Q50, you can HD Radio and SiriusXM Satellite Radio. The Q60 on the other hand, can be equipped with a 13-speaker audio system. Visit Suburban INFINITI of Troy to compare the Q50 and Q60 yourself and take any available model on a test drive. Our professional sales representatives will help you compare models and packages in order to ensure that you drive off of our lot with the vehicle that suits your driving needs and lifestyle best. 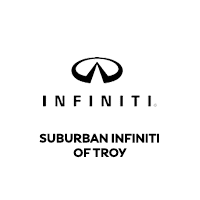 At Suburban INFINITI of Troy, great service does not stop with the sale of your vehicle. Be sure to visit our dealership service center where our factory trained technicians will help keep your investment running like new.